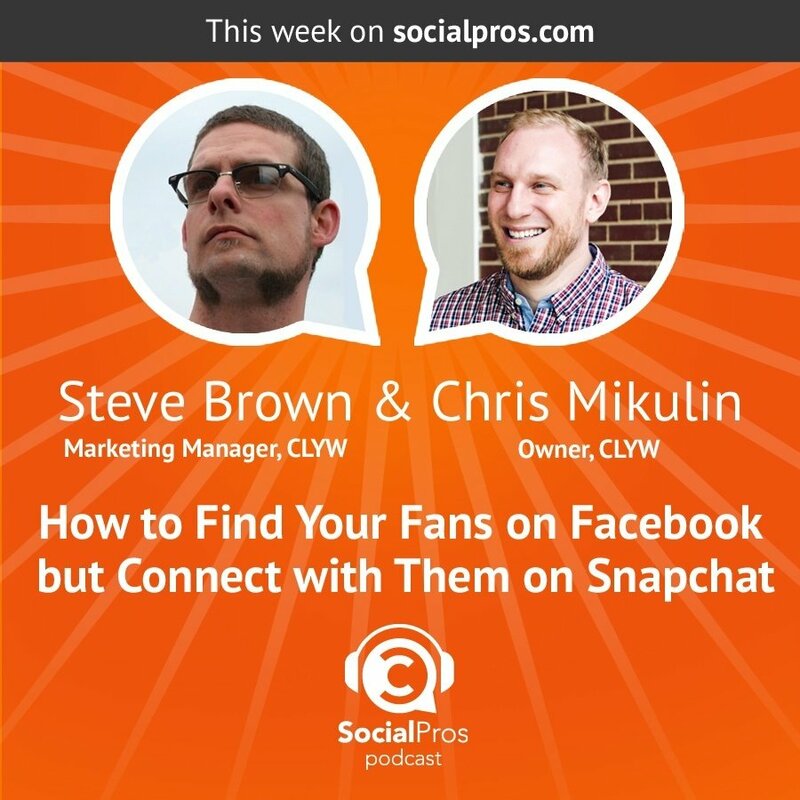 Another month, another incredible round of guests on the Social Pros Podcast. 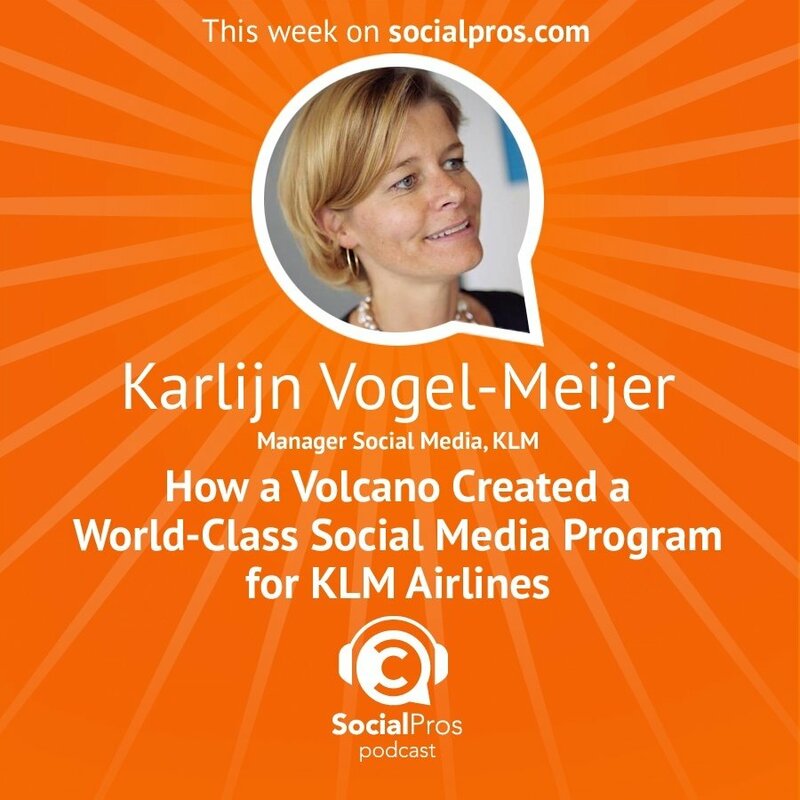 In April, we chatted with the manager of a huge social media team at KLM, an author on thought leadership, Pet360’s PR and social media expert, and the two-man social media team of Canadian yo-yo company CLYW. Karlijn Vogel-Meijer is the Manager Social Media at KLM (the Royal Dutch Airlines). She oversees a social media team of 150 who provide customer support 24/7 in 14 languages. But KLM isn’t just on social for customer support, of course. At last count, KLM is doing $26 million (US dollars) a year in direct social media sales, based on last touch, 30-day cookie conversion. Move fast, break things, and don’t be afraid to fail. Karlijn has seen great success with things like Facebook’s advanced targeting and the viral Sherlock, the lost and found dog video by embracing the fact that mistakes will be made. For example, if you look at KLM’s social media campaigns last year, they were on every channel. They felt the need to be everywhere. But that just wasn’t working. Now they’ve learned to focus their efforts on channels that are able to support the three pillars of their strategy: service, brand reputation, and commerce. 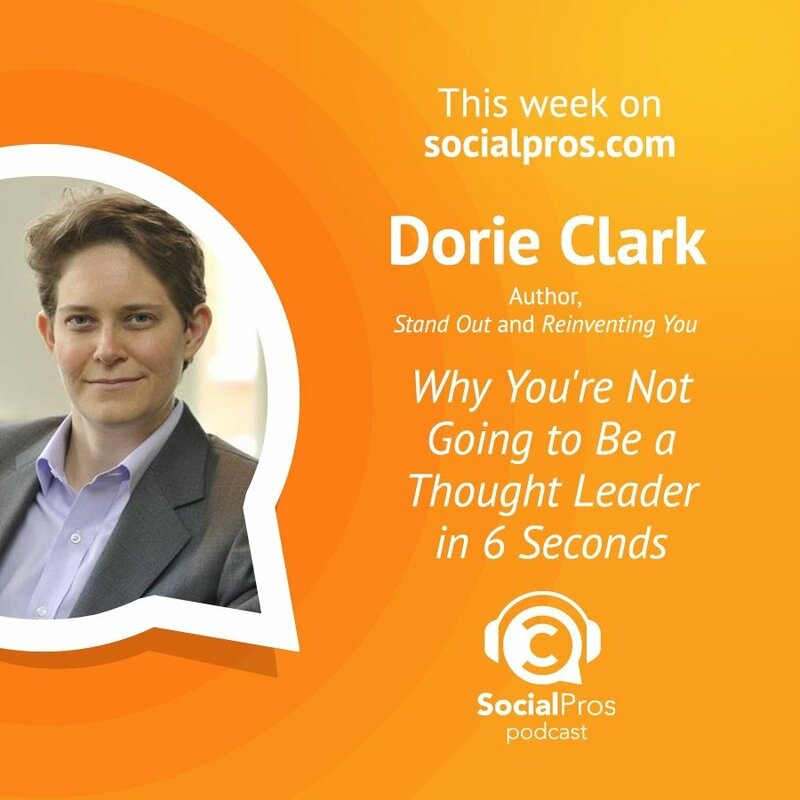 Dorie Clark is a thought leader on thought leadership, and the author of “Reinventing You” as well as her brand new book “Stand Out,” released April 21. She’s gotten to where she is today through having patience, taking risks, and setting goals. Setting goals that are measurable is important. The human brain is wired to shift goal posts. For something as abstract as a goal of being successful as a thought leader, it’s easy to skip victories in a constant effort to keep moving forward. I’m a very big fan of being really clear in the goals that you set. Dorie says you can set goals any time, but she loves doing New Year’s resolutions. For 2015, to be as nimble as possible and ready to pivot and adjust, she decided to set six-month goals instead of year-long. This January, she set three. 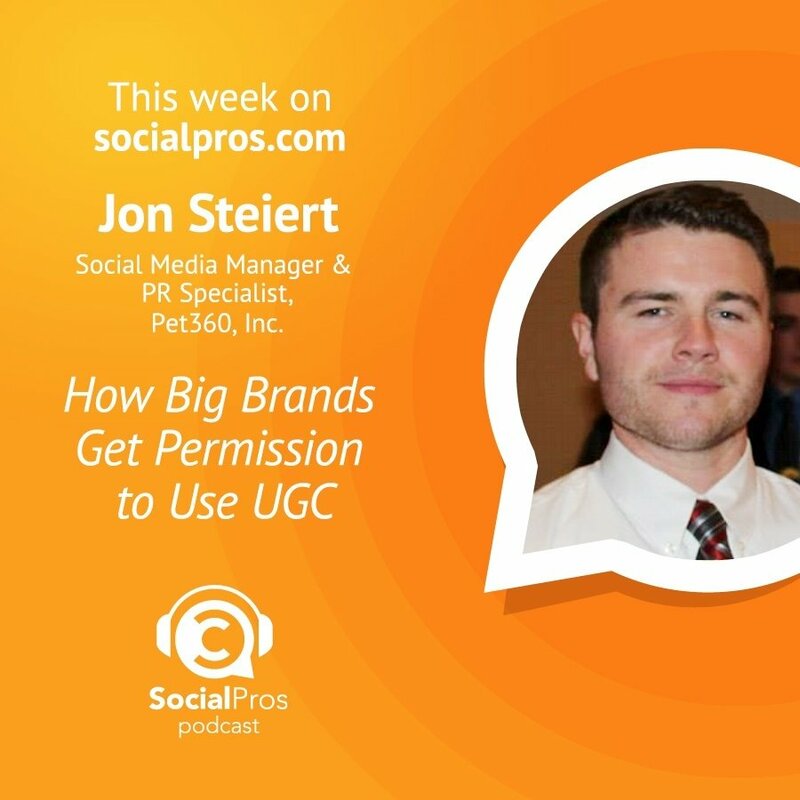 Jon Steiert is the Social Media Manager & PR Specialist at Pet360, Inc, where traffic from social to the website has gone up 800% since his start in September of 2013. That’s due, in large part, to the ability to spend more time and resources on developing their strategy. Listening allows you to be a better communicator by understanding what people need from you. There is never a shortage of content to post on social media thanks to the 75–80 pieces of content created each month in-house or by freelancers and the huge amount of user-generated content they utilize from pet owners. Collecting feedback and paying attention to which pieces resonate has been key to Pet360’s success on social media. In addition to listening to your audience, Jon also highlights the benefits of listening to those who know more than you do in the social media sphere. Jon feels a lot of his growth and success has come from things like listening to the Social Pros Podcast and having a mentor. In 2012, Jon responded to a Tweet requesting help with some data entry from Jeff Gibbard, who has continued to be a mentor to Jon ever since. CLYW is a Canadian high-end “return top” company. (Yo-yo is trademarked in Canada.) They are constantly selling out of their limited-edition products and are the #1 yo-yo company on social media. You’d think CLYW would have a social media team in place, but in fact, Owner, Chris Mikulin, and Marketing Manager, Steve Brown are actually behind each post on their channels. While it’s a lot of extra time for them both, they aren’t ready to give it up. They love being able to directly connect with their audience, and they’ve built a very active and loyal fan base by doing so. We have a policy of no hashtag left behind, so we’re always going through and engaging with the fans. What does “no hashtag left behind” mean? It means they respond to every post across social media platforms. They know their audience doesn’t like being marketed to, so instead they focus on telling stories, sharing quality photos and videos, and interacting on a conversational level. To do that, they use Facebook and YouTube for videos, Instagram for photos, and Snapchat for goofy, fun one-on-one interactions with fans who reach out. Right now, if you snap directly at clywcanada, you will get a response directly from Chris. This combination is working really well for them: They have the most used yo-yo related hashtag in the industry right now and are the #1 yo-yo company on social media, with three to four times more engagement than anyone else in the field.